Among present challenges in physicial oceanography, improving the understanding of meso-scale dynamics stands as a major subject. I am interested in bringing better understanding of meso-scale structures dynamics, fate and impact. Our present area of study is the North-Western Mediterranean Sea region. It is shelf-free at the Eastern part and finds the shallow Gulf of Lions at its western part. The hydrodynamics of the area is driven by two major engines : the Northern Current (NC), being part of the general cyclonic circulation of the Mediterranean Sea and strong wind regimes (Mistral, Tramontane and Easterly winds). The NC is known to develop instablilies along its path, generating meanders and eddies , favouring water mass exchanges between the coast and the open sea. Several dynamical aspects can be of interest regarding these processes. We have studied so far several aspects of the present processes, such as the NC variability and distance at the coast or the mechanisms responsibles for the NC intrusions on the shelf. Our approcach is mainly based on using an extensive observational data set and on numerical simulations using the NEMO code , configured for the North-Western Mediterranean area, at 1.2 km in horizontal resolution , named GLAZUR64. Below is an animation of the GLAZUR64 configuration for the Sea Surface Temperature (SST) for 1998 . MEOM Team, LGGE (France), NOCS (UK), LA (Toulouse), Mercartor-Ocean. Ourmieres Y., Zakardjian B., Béranger K., Langlais C., 2011. 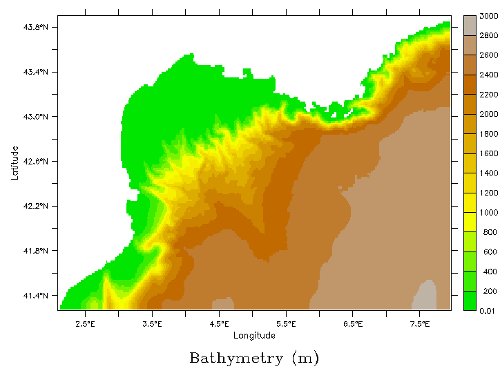 Assessment of a NEMO-based downscaling experiment for the North Western Mediterranean region: impacts on the Northern Current and comparison with ADCP data and altimetry products. Ocean Modelling, 39, 386-404.